This weekend we participated in the Loudoun Lyme 5K. The event was held to raise awareness and find solutions to the problems of Lyme disease, and proceeds benefitted the National Capitol Lyme Disease Association. Luckily, neither we nor the corgis have Lyme disease—I am as paranoid as they come when checking for ticks after being outside. The corgis are trained to roll over for me when I say, “Time to do a tick-check.” You can find out more about the organization at www.loudounlyme.org. “Lyme disease is a bacterial spirochete, named Borrelia burgdorferi, transmitted by ticks and may be accompanied by several co-infections. Lyme disease is growing at four times the rate of AIDS and is quickly becoming our nation’s most misdiagnosed and fastest-growing infectious disease. Estimates state that only one out of every ten cases of Lyme disease is reported and that many people are misdiagnosed. Over 38,000 cases reported by the CDC in 2009 are more likely estimated to represent over 380,000 cases. Lyme disease may be difficult to diagnose, because many of its symptoms mimic those of other disorders like multiple sclerosis, arthritis, chronic fatigue syndrome, lupus and Alzheimer’s disease. In addition, the only distinctive hallmark unique to Lyme disease, the “bulls-eye” rash, is absent in almost half of the people who become infected. The inadequacies of today’s laboratory tests make proper diagnosis difficult, because they were meant for surveillance purposes rather than diagnosis. Misdiagnosis of the infection can lead to protracted disease that is difficult to treat. My husband and I attended the event to support awareness and treatment for Lyme disease by sponsoring a booth to promote Corgi Capers. 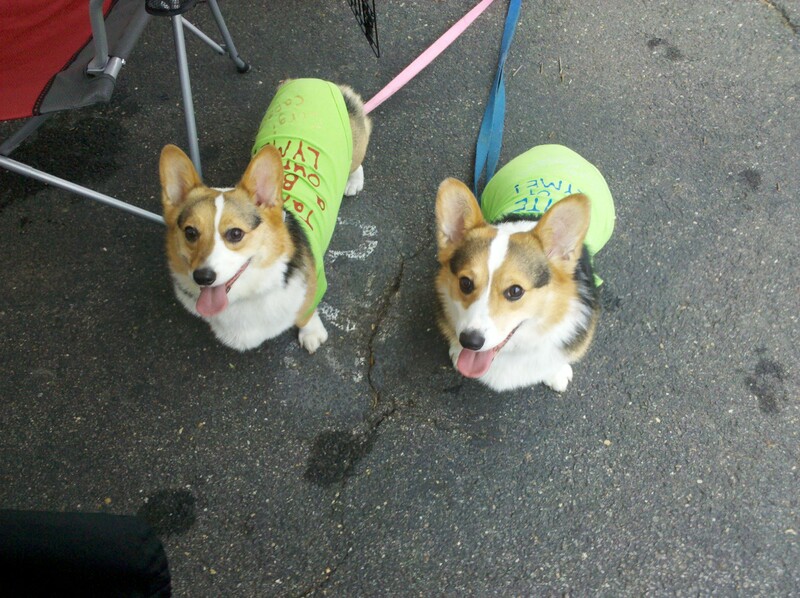 We took both corgis to the book signing. This was the first time they were together in a public setting that included lots of dogs. The challenge with the corgis is that they play off of each other’s bad habits. Yoda is a barker. Any jingling of a dog tag, any echoing bark, any retracting leash sets him off. Leia feeds off that energy by biting on Yoda’s leash and tugging as hard as he can. They did relatively well, though, settling down quickly. By the end, they weren’t even barking at any of the dogs. The event highlighted their personalities. Yoda, afraid of many irrational things, was fearless at the event. He spent most of the day sitting at the center of a gathering of children, letting them pet him, talk to him, and performing tricks when requested. The children even helped to keep him quiet when another dog was passing by—and Yoda was more cooperative listening to them than he was to me. Yoda has always had a sense of propriety, knowing how to act among different types of people, children being one such group. Leia, on the other hand, was the typical diva. At first she ran jealously to whoever was petting Yoda, demanding attention. But when the runners gathered around our tent for the sponsored pre-race warm-up, Leia freaked out and insisted on sitting on my lap, burying her face under my arm to avoid the intimidating crowd. Yoda, on the other hand, sat with the children, never flinching a muscle. It was a fun day, even with the cool temperatures and misty rain. I encourage you to check out www.loudounlyme.org and the Lyme resources there. The best way to combat the disease is to be educated about it: the faster it is caught, the easier it is to treat—usually with a simple dose of antibiotics. It’s when it’s not caught that it travels around and gets dangerous. So as the warm weather settles in, have fun outdoors—but check for ticks! 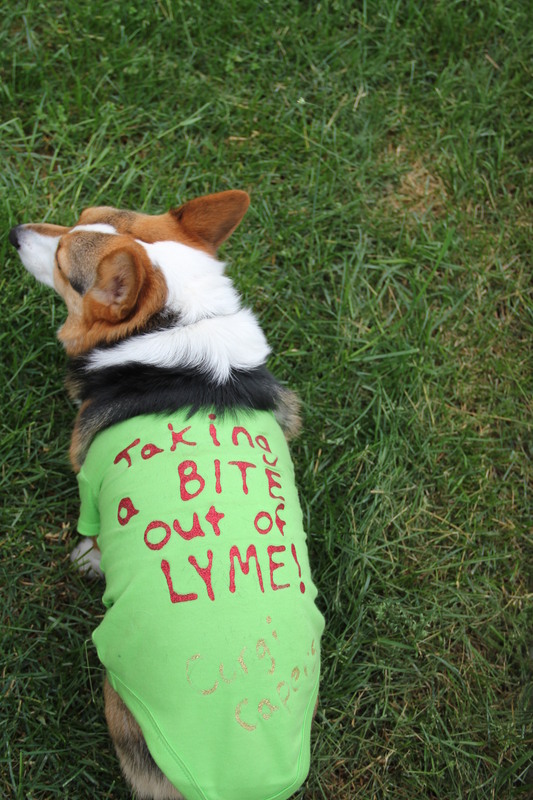 Posted on May 8, 2012, in corgi, inspiration, Lyme and tagged Lyme. Bookmark the permalink. 6 Comments.